Mobile friendly websites are important to Google, and your users. More than important, these days mobile friendly websites are non-negotiable! Not only are your current and potential customers visiting your website on mobile devices more than ever before, now Google is telling them if it will be readable on their phones, before they even click thru to your site. 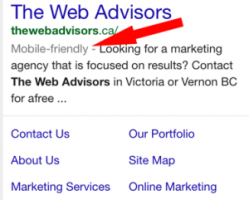 Google recently announced they have added a “mobile-friendly” label to their mobile search results. They created this new labeling system as a way to allow those that are searching from mobile devices, be aware if they will be going to a site that may not be the best experience from a smaller screened device. According to their post, the change will be rolling out globally over the next few weeks, however we noticed it working in Canada this morning, as you can see from our screen capture. There are a number of tools that Google identified could be used to test if your website is mobile friendly. You can view those here. You can also conduct an online audit to get those details, and a number of other key performance indicators that will help your website flourish online. Why this is really important! Identifying mobile friendly websites within mobile search results is an excellent user experience. Where this really becomes important, and everyone pay attention here, Google stated “We are also experimenting with using the mobile-friendly criteria as a ranking signal.” If you don’t have a mobile optimized website yet, you better start looking to make some changes, or be prepared for some adjustments to your website traffic. What do you think? Do you like the “Mobile-friendly” label? We love mobile optimized websites and we build a number of them. The fact that your business can get a little more screen real-estate to identify you have taken the time to ensure a good user experience – I think is a good thing.